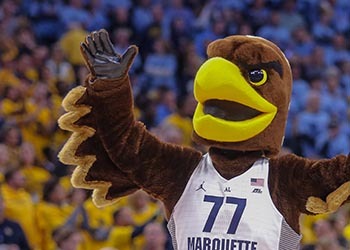 After we officially kick off National Marquette Day at the pep rally, head into the Al McGuire Center as our Marquette women’s basketball team faces Georgetown in a Big East showdown. Reconnect with fellow alumni and fans at a pregame reception on National Marquette Day! Join the College of Business Administration Alumni Association to network and visit with fellow Marquette alumni and friends. Enjoy great food, beer, wine, select cocktails and soft drinks. Bring the whole family! Sign up today. Celebrate National Marquette Day and support engineering scholarships and programs that assist students in their pursuit of a Marquette engineering education. Enjoy game day bites, beverages and network with fellow alumni, family and friends of the Opus College of Engineering. Sign up today. Join fellow alumni and friends of the Marquette College of Nursing for a National Marquette Day pregame reception and lunch! Enjoy a delicious lunch buffet by Irene’s Catering. Sign up today. This is Our Day! The Young Alumni Association invites you to join fellow young alumni at RWB Milwaukee to celebrate #NationalMarquetteDay. Enjoy unlimited beer, cocktails, soft drinks and snacks. Sign up today.